I have developed my range of Ebony bobbins over a number of years now. 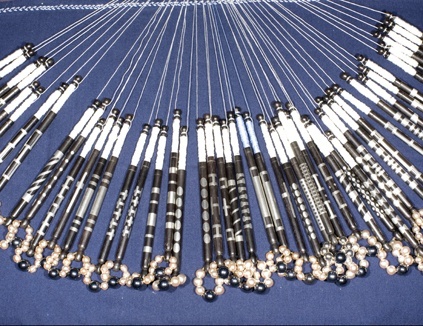 The ebony bobbins are inlaid with pewter bands, spirals, dots and patterns based on traditional & contemporary designs. I believe that I am the only professional bobbin maker reproducing these unique and extremely elegant bobbins. 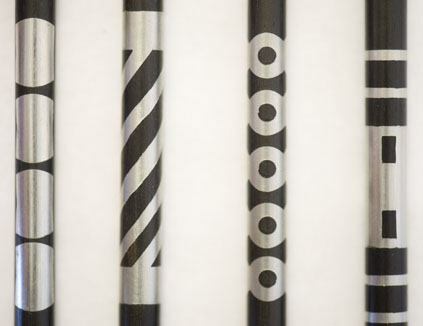 The pattern is cut into the ebony with a computer controlled engraving machine. This is then filled with “molten” pewter, which is cleaned up and then the bobbin is turned and sanding. These are very difficult and time consuming to produce! These luxury bobbins will grace your pillow and make your colleagues extremely envious. Please note I do not keep all designs in stock. Email for what I have today.